Overstrike/Overtype or Insert mode support. Ability to mark ( on the control's vertical scroll bar ) the positions for blocks, expressions or keywords. 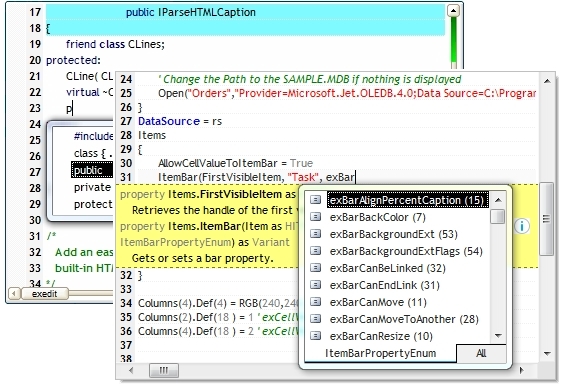 Ability to define keywords or expressions using multiple HTML tags. Ability to define multiple lines expressions (blocks, multiple lines comments). Ability to assign icons and colors to any line. Ability to assign multiple lines HTML tooltips to keywords. Ability to define the HTML format for numbers. Ability to display the control's text using built-in HTML tags. Ability to define sensitive keywords and expressions using built-in HTML tags. Ability to load or save files. Ability to put a picture on control's background. Ability to select a rectangular area using ALT key. Autoindent and brackets automatic indenting. Any font supported, no true type font required. Ability to display a line number border. Ability to insert lines, delete lines on the fly. eXMaskEdit When you have several people entering data in your database, you can define how users must enter data in specific fields to help maintain consistency and to make your database easier to manage. For example, you can set an input mask for a form so that users can only enter telephone numbers in the Swedish format or addresses in the French format. eXCalcEdit Enrich your application with an easy-to-use edit control that supports arithmetic operations. Get results on the fly. The result is displayed as the user types the expression. The control handles double constants and arithmetic operations like +( addition ), - ( subtraction ), / ( division ), or * ( multiply ). The control is fully written in C++ using ATL. The control doesn't require additional files or libraries like MFC or else. eXHelper The Exontrol's eXHelper tool helps you to find easy and quickly the answers and the source code for your questions regarding the usage of our UI components.